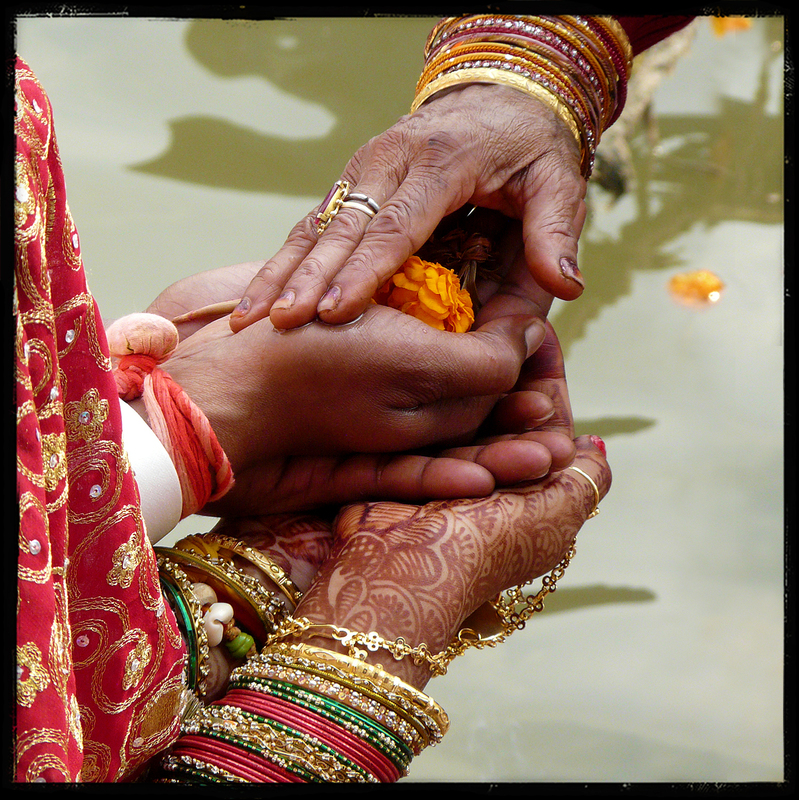 This picture was shot along the holy waters of the Ganges in Varanasi (Benaras) where a new-married couple was getting the blessings from the groom’s mother. This ceremony happens the day after the wedding, early in the morning when the couple is coming to seek blessings from the Goddess Ganga. 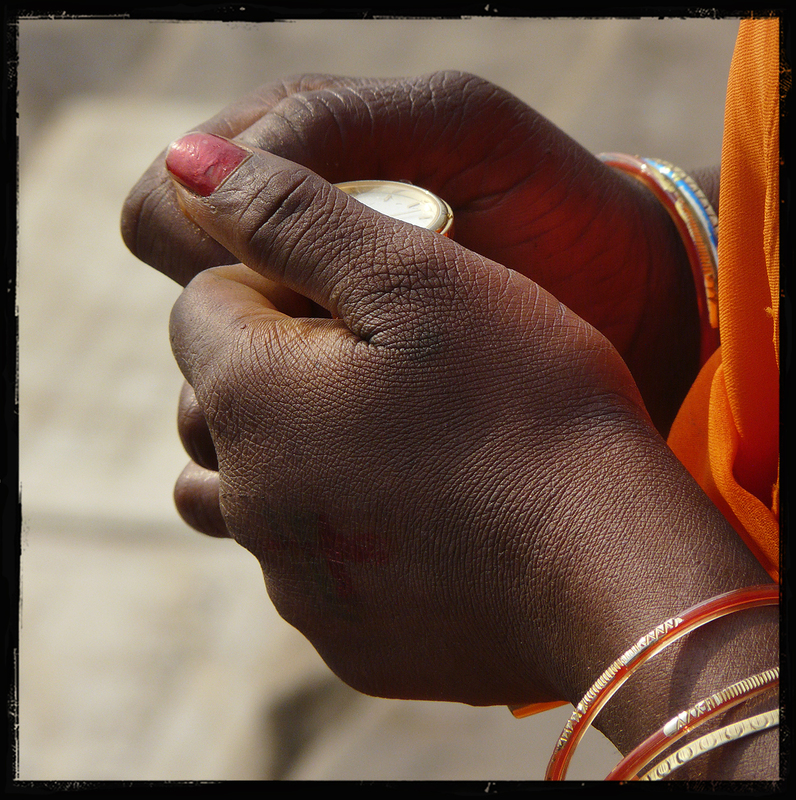 “LIKE” our new Facebook page for RED HALO and join this amazing human adventure in Varanasi. 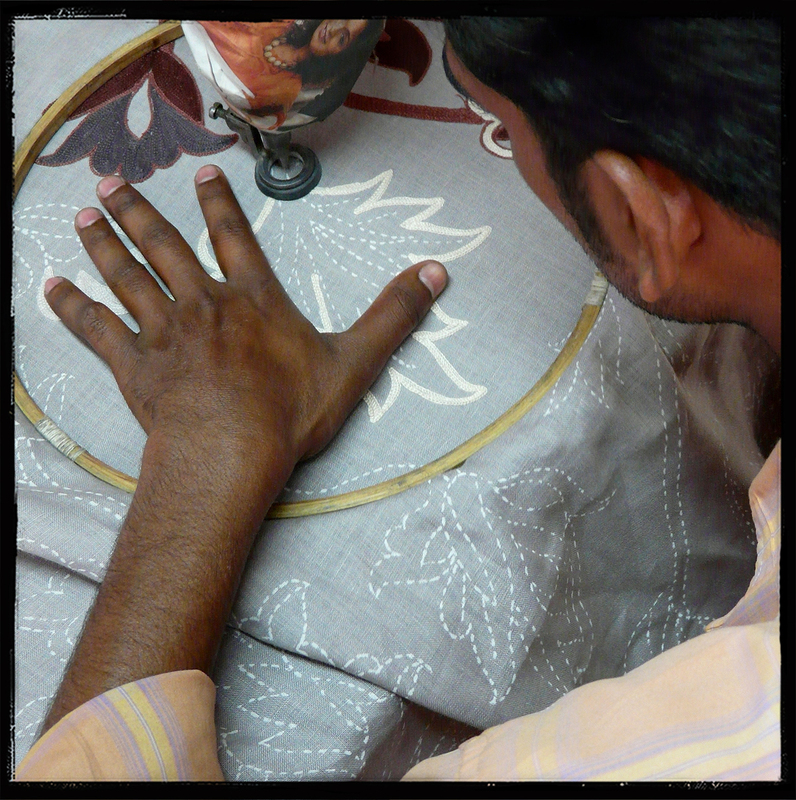 On this picture Jai Prakar is doing a Aari embroidery on a linen throw with our “Lodhi” design, following the design transfered with the lime plaster application. ‎”…They declared that they could make the most magnificent cloth that one could imagine; cloth of most beautiful colours and elaborate patterns. Not only was the material so beautiful, but the clothes made from it had the special power of being invisible to everyone who was stupid or not fit for his post. “What a splendid idea,” thought the Emperor. “What useful clothes to have. This was shot in a little workshop located near the chowk in Varanasi (Benaras) where traditional embroideries have been handed down from father to son since the time of the Mughals when that kind of work flourished. Nowadays men wear that kind of sherwani mostly for weddings and engagement ceremonies. Entering in such a workshop is like releasing a voluptuous fragrance from the past from an old bottle of perfume, it is like opening a door to a dream of magnificence, the splendor of the Great Mughals…. “…Un jour, arrivèrent deux escrocs qui affirmèrent être tisserands et être capables de pouvoir tisser la plus belle étoffe que l’on pût imaginer. Non seulement les couleurs et le motif seraint exceptionnellement beaux, mais les vêtements qui en seraient confectionnés posséderaient l’étonnante propriété d’être invisibles aux yeux de ceux qui ne convenaient pas à leurs fonctions ou qui étaient simplement idiots. “Ce serait des vêtements précieux”, se dit l’empereur. “Si j’en avais de pareils, je pourrais découvrir qui, de mes sujets, ne sied pas à ses fonctions et départager les intelligents des imbéciles ! Cette photo a été prise dans un petit atelier se situant dans le chowk de Varanasi (Benares) où les broderies traditionnelles se sont transmises de père en fils depuis l’époque des Moghols lorsque cet artisanat prospérait. De nos jours les hommes portent ces sherwani essentiellement pour les cérémonies de mariage et de fiançailles. Entrer dans un atelier comme celui-ci revient à libérer une fragrance voluptueuse venant du passé d’une vieille bouteille de parfum, c’est comme ouvrir la porte à un rêve d’opulence, la splendeur des grands Monghols…. “…Then the Emperor himself came with his noblest noblemen, and the swindlers each raised an arm as if they were holding something. They said, “These are the trousers, here’s the coat, and this is the mantle,” naming each garment. “All of them are as light as a spider web. 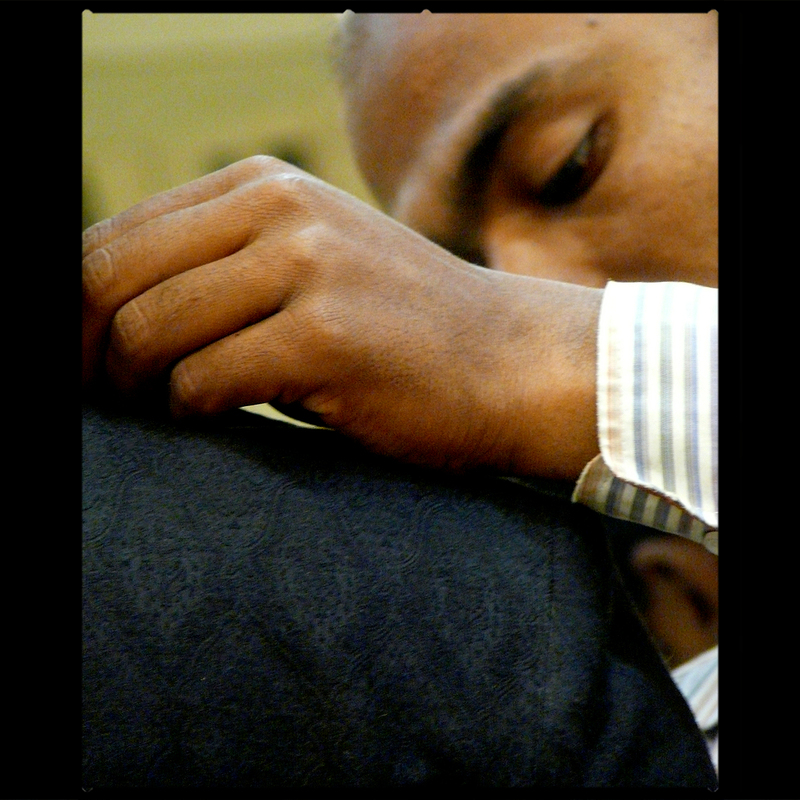 This picture was shot at my tailor in Varanasi (Benaras) during the last fitting of my brother’s sherwani. 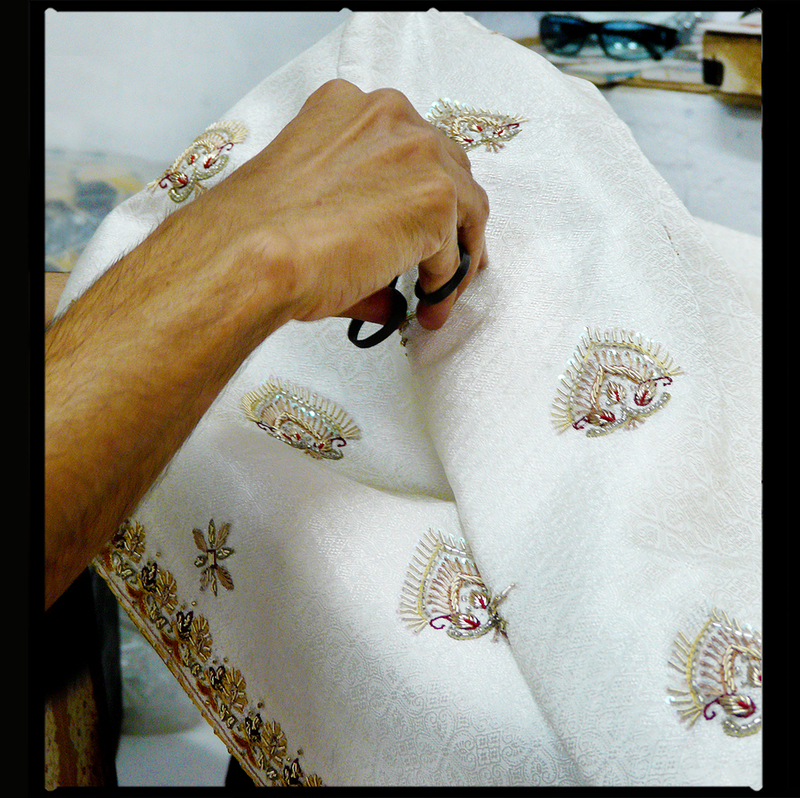 The fabric is a traditional brocade with a Jamawar pattern made of silk and wool from one of our workshops in the city. “…Tous les gens pouvaient se rendre compte du mal qu’ils se donnaient pour terminer les habits de l’empereur. “Voyez, Majesté, voici le pantalon, voilà la veste, voilà le manteau!” et ainsi de suite. Cette photo a été prise à Varanasi (Benares) chez mon tailleur pendant le dernier essayage de la sherwani de mon frère. Le tissus est un brocard traditionnel avec un motif Jamawar en laine et soie provenant de l’un de nos ateliers de la ville. 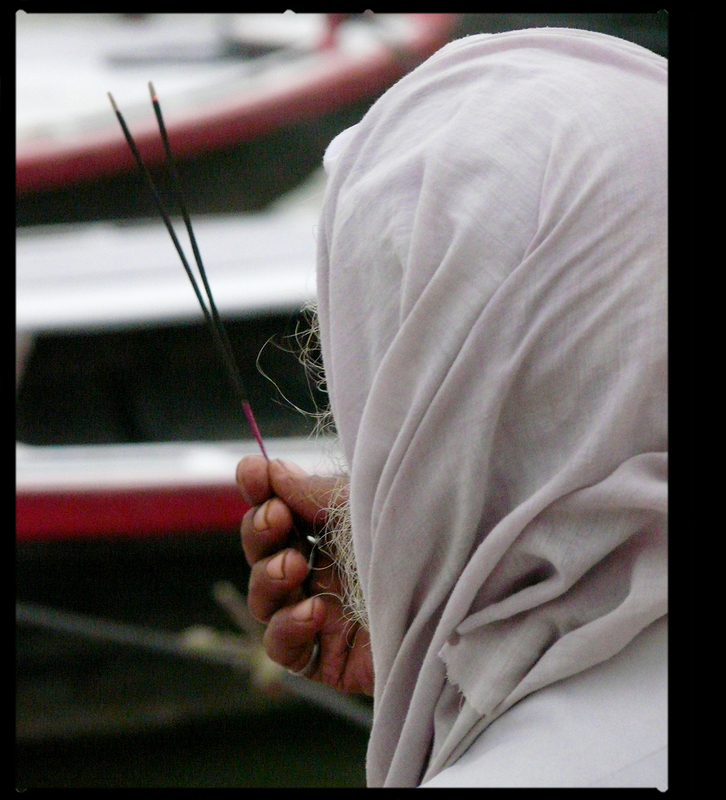 This Holy man was burning incense sticks, as a gesture to Agni, the God of Fire, while facing the Ganges in Varanasi (Benaras). For the sadhu the world is alive with unseen forces that must be continually propitiated with offerings and cleansing rituals. Their sacred fireplaces, known as dhuni, perform the same function as incense, on a larger scale, which is to transform matter into aether. Burning incense is thus a reminder, of the sacred power of fire to transform, and the ultimate journey of all physical matter towards spirit. For most Indians, incense remains an important part of the daily puja ritual, which is a religious offering performed by all Hindus to their deities, especially during the beginning of a new venture, or to commemorate some special occasion. The aspect of the ritual known as Dhupa involves the offering of incense before the picture of a deity, as a token of respect. Indian incense-making involves a wide variety of ingredients. A young lady was standing along the holy waters of the Ganges at Dasaswamedh Ghat, in Varanasi (Benaras). She was keeping the golden watch of her father while he was worshiping in the river. It was after sunrise and the light was already bright. I took several portraits of her but I thought that her hands holding that watch was showing more about who she was, I could feel all the tenderness and respect she had for the most important man of her young life. I showed her those pictures and she smiled at me with modesty. 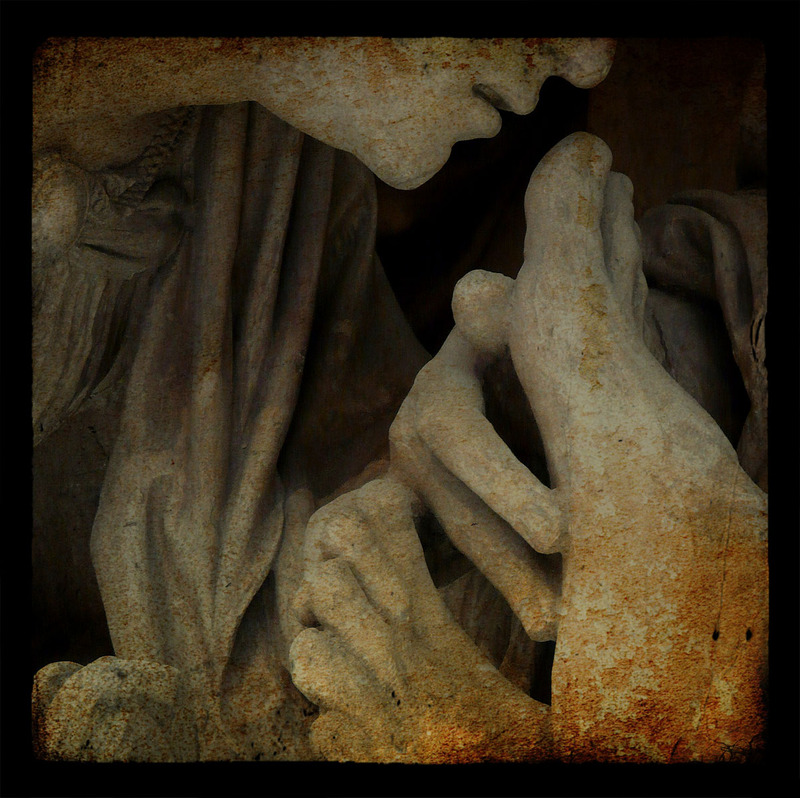 This is a close-up of Ligier Richier’s “Lamentation of Christ” which is in Church of St. Étienne located in Saint-Mihiel, in northeastern France. Ligier Richier (c. 1500 – 1567) was a sixteenth-century French sculptor who might have been inspired by the Mystery plays which are among the earliest formally developed plays in medieval Europe. Medieval mystery plays focused on the representation of Bible stories in churches as tableaux with accompanying antiphonal song. They developed from the 10th to the 16th century, reaching the height of their popularity in the 15th century before being rendered obsolete by the rise of professional theatre.